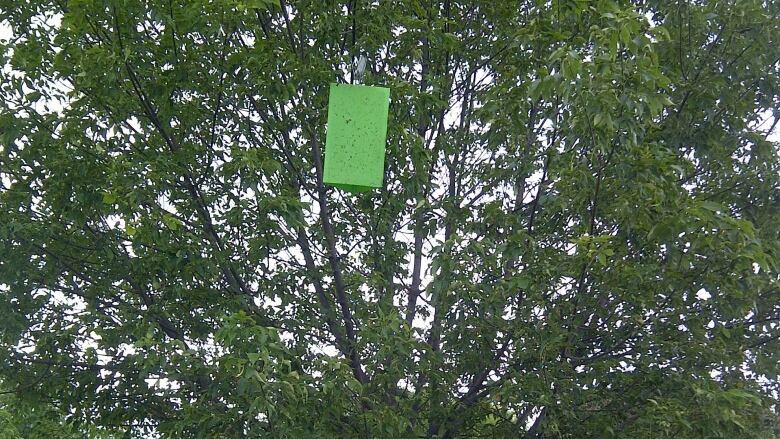 The City of Thunder Bay plans to hang about 50 new "green prism traps" on ash trees this summer, as part of its efforts to fend off the invasive emerald ash borer. The City of Thunder Bay plans to hang about 50 new "green prism traps" on ash trees this summer, as part of its efforts to fend off the emerald ash borer (EAB). The detection traps are part of ongoing efforts to monitor for the presence of the invasive insect, which destroys ash trees. Emerald ash borers have not arrived in Thunder Bay yet, but have been rapidly spreading across North America. The insects have been found in areas as close as Duluth, MN, and Sault Saint Marie, Ont. If the insects do arrive in Thunder Bay, it's important that they be detected quickly. "About one quarter of Thunder Bay's street trees are ash trees," city forester Shelley Vescio said in a written release. "When EAB arrives here all of those ash trees will be killed and will require immediate removal to reduce potential hazards." A preventative treatment could also save some trees. The new prism traps will be placed in the canopies of ash trees along city boulevards and in parks, and will be monitored until the beginning of September.